Why are refugees dying on the shores of prosperous, peacetime Europe? Are the numbers really unmanageable? And what if border controls brought more migrants into the rich world, not less? 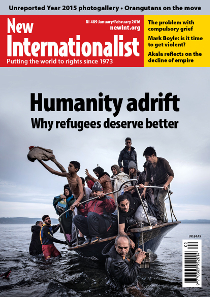 This month’s New Internationalist digs deeper into the backstory to Europe’s refugee crisis – and lays out an alternative, humanitarian vision that recognizes the reality of 21st century migration. David Styan on life in continental Africa's least-populated state.